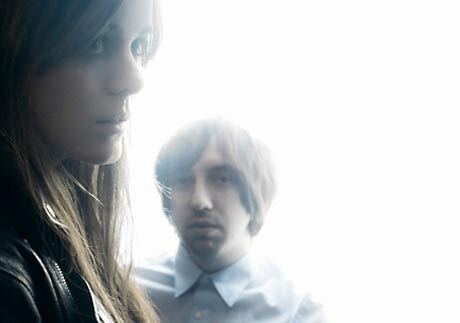 Brooklyn-based duo the Hundred in the Hands have signed with top-notch electronic imprint Warp Records, who will put out two releases of the band's "elegant French pop, blissed-out dub, house and post-punk." Or at least that's how the press release describes their sound. This spring, the Hundred in the Hands will drop two twelve-inch EPs on Warp. The first is a single for their track "Dressed in Dresden," which comes bundled with three remixes courtesy of Kyle Hall, Various Production and Maxime. The track is described as "a furiously addictive slice of post-punk-funk guitar pop." The twelve-inch can be pre-ordered here, and will be released on April 6 in North America. The other release is more of a proper EP. Titled This Desert, the six-song effort will whet appetites for the band's full-length debut due this fall. According to the band, the EP is "the more ethereal, gauzy side of our tastes; the Summertime-Gothic and dreamy tracks we made thinking they'd go well with open hydrants and looks that kill." While that feels a little pretentious, the label promises the EP will deliver "something that doesn't feel confused, fake or forced. It just feels fun." This Desert will be released on May 18. The track "Ghosts" can be streamed here, and the EP can be pre-ordered here.